Nov. 27, 2017 | Stephen Thompson --Phoebe Bridgers' songs come laden with sly, finely detailed observations about unsuccessful flirtations with hypnotherapy, unsettling conversations about Jeffrey Dahmer, and everything in between. Her phrasing is impeccable — warm, cool, conversational, gently slurred — but her songs also swim in the self-aware obsessions and messy meanderings of an unquiet mind. 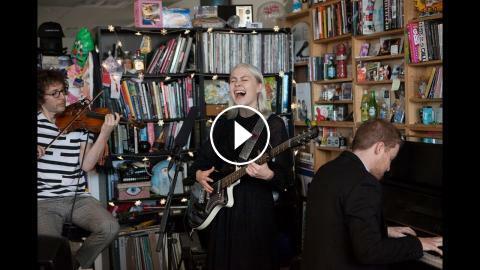 Joined by Ethan Gruska and Rob Moose, Bridgers popped up at the Tiny Desk a couple weeks after the release of her full-length debut, Stranger In The Alps. Together, they celebrated the occasion with languid renditions of three of the album's best songs: the sad and seductive "Demi Moore," a drastically muted "Motion Sickness" and a piano-driven take on Bridgers' first-ever single, "Killer."